Sometimes I deliver the content of my work in a variety of ways. For instance, usually when I am giving a conference paper or address, I tend to use prezi. So, if you have this program or application or have signed on to its service, these presentations with all their remarkable visual material are there to see. In some ways, I think we need to start thinking about how this structure of presentation can be gathered into a different kind of publication.... Here are some of my presentations from this year. I have a few more Keynotes in October and I will try and post those as they arise. This presentation describes a transformed public world that allows the private public person to move through the boundaries of what in the past was public and political activism. These lines of activity where the private takes over the public world have a long history of connection through boycotts and even as Banet-Weiser describes as the consumer subjectivity at that core of the civil rights movement in the US, but this presentation works to articulate this subtle and expanding structure of a privatized public discourse at least partially expressed through celebrities. “Constructing the Intimate Public: Public Persona and the bifurcation of representation and presentation in contemporary political campaigns” Contemporary Publics International Symposium, 24 - 25 February 2014, Deakin University. This is a development of how politics is transforming under new forms of parasocial connection that are most prominent in major political campaigns such as Obama's recent presidential campaigns and Kevin Rudd's work in Australian political campaigns. “Persona as method: exploring celebrity and the public self through persona studies’ approaches” (with Kim Barbour and Chris Moore) Celebrity Studies 2nd International Conference, London, 19-21 June 2014 Royal Holloway University of London. Prezi available at: http://prezi.com/3bqhnkautfxt/?utm_campaign=share&utm_medium=copy This presentation maps out three approaches to the study of persona - the employment of Interpretive Phenomenological Analysis in interview ethnography, digital visual analysis of the representation of the self, and an adaptation of "prosopography" to map reputation in the contemporary moment within networks and communities. are This presentation mapping the intentions for the public personality to be associated with highly stylized - and usually beautiful - constructions of themselves. Beyond the economic benefits, these moves articulate forms of public control of image as much as the commodification of the self into a product. http://prezi.com/dtojyic-bcee/?utm_campaign=share&utm_medium=copy This presentation links some of my key conceptual innovations. Intercommunication definitionally identifies the current blend of communication and media as well as the interpersonal filter that is at play in much of the movement of content and discussion via social media and other online connections. This new way of connecting establishes a discipline of structure for the organization of the public presentation of the self: formations of patterns of persona construction are evident in online culture which move the utopian and dystopian debates about technological change to a different vista of analysis. I am regularly asked for my expert commentary on radio and sometimes television. In addition, I occasionally do a guest lecture which is recorded in some way. What follows are some of my recent media appearances. and how celebrities use fame to cover up questionable behaviour. 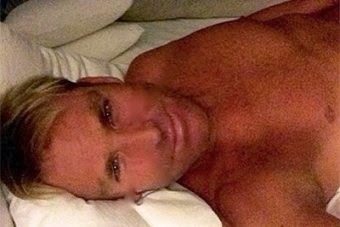 A follow-up interview with 6PR on the same topic and removing Harris from Perth's Walk of Fame. Attached to this event, I was interviewed about what the Contemporary Publics International Symposium was attempting to achieve. The event was held at Deakin on the 24- and 25th of February 2014. My little promotion talk gets in to what the plural publics entails. The last part of the interview is connected to my specific research on celebrity and persona. Follow the link to the video. "Celebrity Performativity and the Age of the Selfie"
28 July 2014 - Guest lecture Interview: Here is a direct interview and part 3 of the interview on Youtube. "Celebrity Performativity and the Age of the Selfie," -Part one has sections of an actual lecture and the lecturer, Adam Brown's melecture. All worth seeing. The direct interview and part 3 of the direct interview is probably the best visual and aural version of my research available. Also incredibly useful for those trying to build teaching resources and a style to construct - Adam Brown's approach is one of the best I've seen. 12 June 2014 Scholars Circle - Radio Interview on Celebrity Industrial Complex with David Giles, Joshua Gamson and David Marshall - with Maria Armoudian - an independent syndicated program. This program pulled together three major scholars that have studie celebrity. 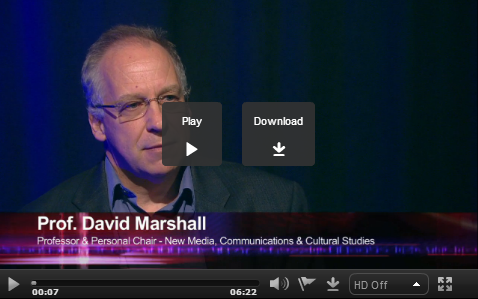 When too much information is barely enough; life in the online age means constant maintenance of our public personas, says David Marshall, Chair of New Media, Communication and Cultural Studies at Deakin University. There is a link to an audio file of the show and interview from this site. There are, of course, other interviews and other presentations, but I hope this selection of some of my most recent might be interesting. Pass on your comments on any of this material - the most public version of my work!! I could not stand writing essays at the university, because I did not have the necessary skills for this. I preferred more math, so I even bought research papers for sale when I had to write it by myself, anyway thanks for the tips.